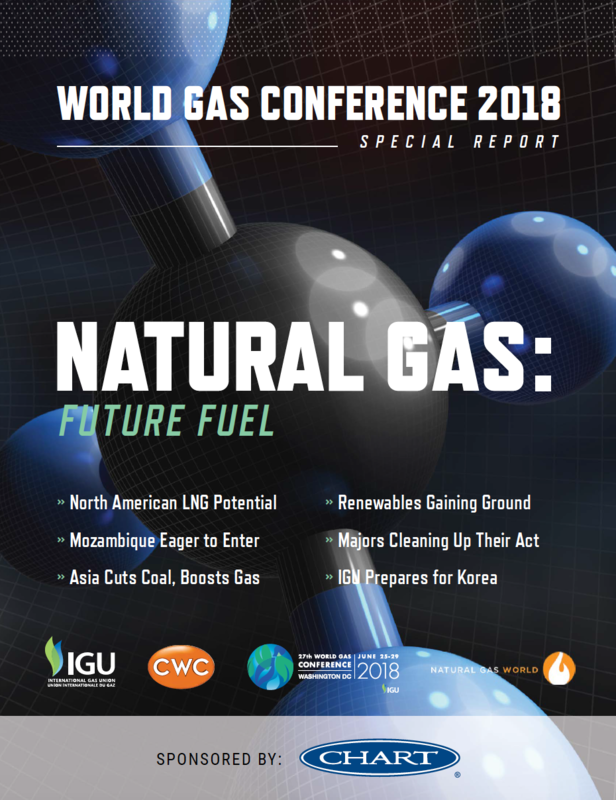 Natural Gas World, in conjunction with CWC, which organized the 2018 World Gas Conference in Washington, DC, and the International Gas Union, which co-hosted the event with the American Gas Association, is pleased to offer a special WGC 2018 editorial report. Prepared by the NGW editorial team, this 52-page special edition provides a broad spectrum of the debates and discussions at the five-day conference and sets the stage for WGC 2021 in Daegu, South Korea. We trust you will find it informative. By subscribing above you consent to receiving emails from Natural Gas World, which may include news alerts, newsletters, invitations to events/webinars, announcements and advertising. Please note that you can unsubscribe at any time. Your details are shared with our email marketing service provider. The permission to have your email activity tracked means that you allow us to see which content you click in our emails which informs us of the content you are most interested in, allowing us to improve our news coverage and customize better the content we deliver to you.